Aurelia Metals Limited (ASX:AMI) is focused on the development and exploration of the high grade Hera-Nymagee Project in the Cobar district of NSW. Aurelia is actively drilling the evolving copper deposit at Nymagee with the potential that the Nymagee mineralisation may evolve into another 'Cobar Giant' similar to the world class CSA copper deposit located approximately 100km north-west along strike. Aurelia also remains active in the exploration for copper, gold and tin on a number of tenements in the Lachlan Fold Belt of NSW. 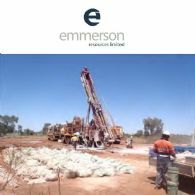 Emmerson Resources Limited (ASX:ERM) (OTCMKTS:EMMRF) is pleased to announce results of recent drilling from two of its five projects. The results from Kadungle are strategically important as they represent the emergence of new gold-copper projects in NSW, where Emmerson has a commanding ground position. 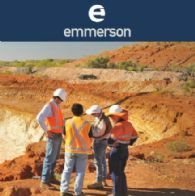 Emmerson Resources Limited (ASX:ERM) (OTCMKTS:EMMRF) provides the Quarterly Activities Report for the period ending 31 December, 2017. Emmerson Resources Limited (ASX:ERM) is pleased to announce preliminary results from two of the drill holes at its Kadungle, Mt Leadley prospect in NSW, where Emmerson can earn up to an 80% interest from Aurelia Metals by spending $0.5m over a five-year period. Emmerson Resources Limited (ASX:ERM) (OTCMKTS:EMMRF) is pleased to announce the results of a highly successful geophysical survey at Kadungle, one of its most advanced projects in NSW. Drilling on this project will commence shortly, as will drilling at its Tennant Creek project in the NT. 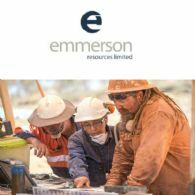 Emmerson Resources Limited (ASX:ERM) (OTCMKTS:EMMRF) provides the Company&apos;s Quarterly Activities Report for the period ending 30 June, 2017. Emmerson Resources Limited (ASX:ERM) (OTCMKTS:EMMRF) is pleased to announce that our first drill hole at Kadungle in NSW has intersected high level epithermal gold-silver mineralisation and deeper porphyry copper-gold within a very extensive zone of alteration. Emmerson Resources Limited (ASX:ERM) (OTCMKTS:EMMRF) is pleased to announce that our first drill hole at Kadungle in NSW has intersected visible sulphides within an extensive zone of alteration. 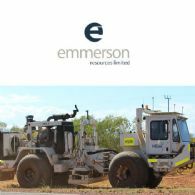 Emmerson Resources Limited (ASX:ERM) (OTCMKTS:EMMRF) is pleased to announce the commencement of exploration over four of our NSW projects. These projects were generated from the application of proprietary, predictive 2 and 3D targeting models - developed in conjunction with our strategic alliance partner Kenex Limited. Emmerson Resources Limited (ASX:ERM) present the Quarterly Report for the Period Ending 31 December 2016 with the following hey highlights. 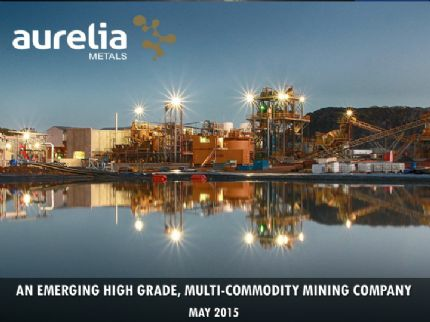 Aurelia Metals Ltd (ASX:AMI) are pleased to provide a quarterly activities report for the period ending June 2015. 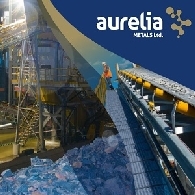 Aurelia Metals Ltd (ASX:AMI) announces that is has deposited a conversion notice with Glencore Group Funding Limited (Glencore) in respect of its A$50,000,000 Facility B Converting Notes. Aurelia Metals Ltd (ASX:AMI) here provides an operational update on the Hera gold-lead-zinc project and its expansion study, together with an update on the Company&apos;s financial position, and on the Company&apos;s strategy in response. 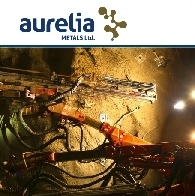 Aurelia Metals Ltd (ASX:AMI) here reports that the Hera Resource Estimate as reported to the ASX in April 2015 has now been revised. Whilst tonnage has been reduced to 2.5Mt, and the gold grade has been reduced from 3.75g/t Au to 3.48g/t Au, the grade of silver, zinc and lead have all increased as a result of the revision, and overall, the resource model demonstrates that Hera remains a high grade deposit. 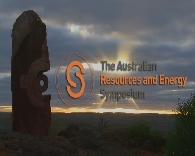 Aurelia Metals Ltd (ASX:AMI) Sydney Resources Roundup Presentation contains forecast rates for the production of gold, lead and zinc from the Hera Project. Aurelia Metals Limited (ASX:AMI) is pleased to provide an update on exploration at its 100% owned, high-grade Hera gold-lead-zinc project in central NSW. Rimas Kairaitis, Managing Director commented "The declaration of Commercial Production at Hera on 1 April marks a major step in Aurelia&apos;s growth. 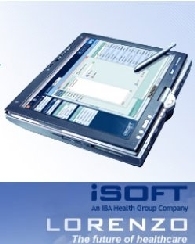 We are now focused on optimisation and ramping up to full scale production. The recently announced resource upgrade highlights the potential of the Hera orebody to continue to grow in size. Aurelia Metals Limited (ASX:AMI) is pleased to report a substantial upgrade to the Hera Mineral Resource Estimate at its 100% owned, high-grade Hera gold-lead-zinc project in central NSW. The Mineral Resource estimate has been completed in accordance with the guidelines of the JORC Code (2012 edition). Aurelia Metals Limited (ASX:AMI) advises that commercial production has been declared at its 100% owned Hera gold-lead-zinc mine in NSW following completion of commissioning of all key components of the processing plant. Assay results have been received from further drillholes into the Hera North discovery. Results have further extended the high grade mineralisation, with Hera North remaining open at depth. All of the Hera North mineralisation lies outside the existing Hera Resource. This Aurelia Metals Ltd (ASX:AMI) investor presentation contains forecast rates for the production of gold, lead and zinc from the Hera Project. These production targets were developed under a Definitive Feasibility Study (&apos;DFS&apos;) as announced to the ASX on the 19th September 2011. Aurelia Metals Limited (ASX:AMI) is pleased to provide an update on exploration at its Hera gold-lead-zinc project. Aurelia Metals Limited (ASX:AMI) ("AMI" or the "Company") is pleased to provide an update on exploration at its Hera gold-lead-zinc project. Aurelia Metals Limited (ASX:AMI) advises it has forward sold 10,500 ounces of gold at an average price of A$1591/ounce, with scheduled deliveries commencing at the end of February 2015 through to September 2015. 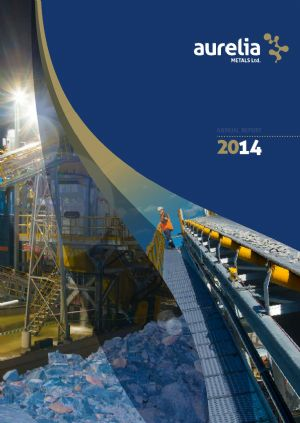 Aurelia Metals Ltd (ASX:AMI) announce the Quarterly Activities Report for the period ending December 2014 with significant highlights. Aurelia Metals Limited (ASX:AMI) is pleased to provide an update on mining, exploration and commissioning activities at its Hera gold-lead-zinc project. 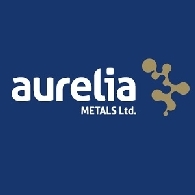 Aurelia Metals Ltd (ASX:AMI) is offering a non-renounceable Offer to Eligible Shareholders on the basis of 1 New Share for every 8 Shares held at 7.00 pm (Sydney time) on 22 December 20143 at an issue price of $0.234 per New Share. Aurelia Metals Limited (ASX:AMI) is pleased to announce a fully underwritten, non-renounceable rights issue pursuant to which eligible shareholders will be entitled to subscribe for 1 new share for every 8 shares held at $0.234 per share to raise approximately $10.0 million. Aurelia Metals Limited (ASX:AMI) ("Company") is very pleased to announce that the Hera gold-zinc-lead mine was formally opened yesterday by the NSW Minister for Resources and Energy, Mr Anthony Roberts MP and Mr Kevin Humphries MP, Member for Barwon. The opening was attended by Aurelia employees, Directors, shareholders, project partners and members of Nymagee community. Aurelia Metals Limited (ASX:AMI) is pleased to provide an update on development, exploration and commissioning activities at its Hera gold-lead-zinc project. Aurelia Metals Limited (ASX:AMI) is pleased to announce the appointment of Mr Tim Churcher to the role of Chief Financial Officer (CFO), based in the Company&apos;s head office in Orange. This investor presentation by Aurelia Metals Ltd (ASX:AMI) contains forecast rates for the production of gold, lead and zinc from the Hera Project. These production targets were developed under a Definitive Feasibility Study (&apos;DFS&apos;) as announced to the ASX on the 19th September 2011. Aurelia Metals Limited (ASX:AMI) is pleased to provide an update on development and commissioning activities at its Hera gold-lead-zinc Project. Aurelia Metals Limited (ASX:AMI) is delighted to announce the first gold-silver pour at its Hera gold-lead-zinc-silver deposit. Aurelia Metals Limited (ASX:AMI) is very pleased to provide an update on results from exploration drilling near the Hera gold-lead-zinc deposit, where high grade gold, zinc, lead and silver have been intersected outside of the existing Hera Resource and Reserve. The Hera-Nymagee Project represents Aurelia Metals&apos; (AMI) flagship Project and consists of the Hera goldbase metal deposit (AMI 100%) and the Nymagee copper deposit (AMI 95%), and is located approximately 100km south-east of Cobar, hosted in the Cobar Basin rocks of central NSW. The Cobar Basin also hosts the major mineral deposits at CSA (Cu-Ag), The Peak (Cu-Au) and Endeavor (Cu-Pb-Zn-Ag). 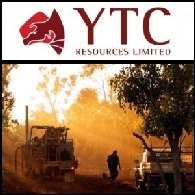 YTC Resources Limited (ASX:YTC) is pleased to provide an update on development and exploration activities at its Hera-Nymagee Project. 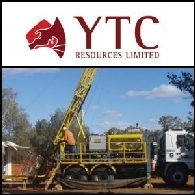 Thomson Resources Limited (ASX:TMZ) - The discovery of significant Cobar-type deposits at Hera, Nymagee (YTC Resources (ASX:YTC)) and Mallee Bull (Peel Exploration (ASX:PEX)) have further highlighted the prospectivity of the Cobar region for polymetallic deposits. 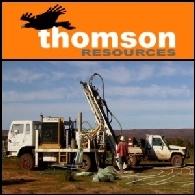 Thomson Resources has been exploring north and northwest of Cobar for similar deposits with significant success at Cuttaburra, but further exploration has been delayed by excessive wet weather. 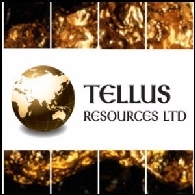 Asian Activities Report for May 26, 2011 includes: Tellus Resources Limited (ASX:TLU) has completed A$4.25 million initial public offering to fund gold projects in NSW; YTC Resources Limited (ASX:YTC) announced further drill results from the Hera Gold and Base Metals Project; Castle Minerals Limited (ASX:CDT) reported wide zones of gold mineralisation within its extensive Wa Project in Ghana; Mindoro Resources Limited (ASX:MDO) announced strong nickel results from the Bolobolo nickel target in the Philippines. 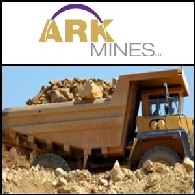 New South Wales focused polymetallic exploration company Ark Mines Limited (ASX:AHK) today announced that is has applied for 99 exploration units totalling 287 km2 in the Lachlan Fold Belt near to the company&apos;s Babinda project. Australian Market Report of February 18, 2011 includes: YTC Resources Limited (ASX:YTC) announced further strong drill results from the northern section of the Nymagee Copper Deposit; Meridian Minerals Limited (ASX:MII) has signed a non-binding Heads of Agreement to acquire a 75% interest in the non-alluvial assets of Russian gold company ZAO ZRK Omchak; Peninsula Energy Limited (ASX:PEN) confirmed high grade uranium resource in South Africa; Hot Rock Limited (ASX:HRL) commences its first major exploration program at two geothermal projects in Chile. 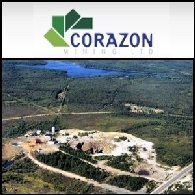 Australian Market Report of November 26, 2010 includes: Corazon Mining Limited (ASX:CZN) acquires additional exploration projects in Canada; YTC Resources Limited (ASX:YTC) announced further strong copper results in NSW; Apollo Minerals (ASX:AON) has completed its four-hole reverse circulation drilling programme in Western Australia; Ampella Mining Limited (ASX:AMX) confirmed continuity of gold mineralisation at the Batie West Project in Burkina Faso. Australian Market Report of September 24, 2010 includes; YTC Resources Limited (ASX:YTC) has recorded a high-grade copper intersection at its Nymagee Copper Mine, Uranium Equities Limited (ASX:UEQ) has reported outstanding high uranium grades have been intersected at two promising prospects, Gryphon Minerals Limited (ASX:GRY) has raised A$45.2 million via a share placement, to aggressively fast-track exploration at its highly prospective Banfora Gold Project and BHP Billiton Limited (ASX:BHP) (NYSE:BHP) has approved the Macedon gas development located in the Exmouth Sub-basin, Western Australia. 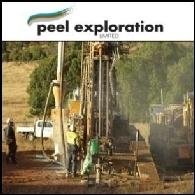 Peel Exploration Limited (ASX:PEX) is pleased to provide a Quarterly Activities Report for the period ended 31 December 2009. During the quarter, Peel Exploration Limited (ASX:PEX) announced it had reached conditional agreement to acquire a 100% interest in the May Day gold-base metal deposit from Imperial Corporation Ltd (ASX:IMP). The May Day gold-base metal deposit (comprising a 100 hectare mining lease - ML1361), is located approximately 100km south of the mining town of Cobar in central NSW. 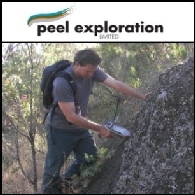 Peel Exploration Limited (ASX:PEX) is pleased to announce it has expanded its NSW exploration portfolio, reaching conditional agreement to acquire a 100% interest in the May Day gold-base metal deposit, from Imperial Corporation Ltd (ASX:IMP). The May Day gold-base metal deposit is located approximately 100km south of the mining town of Cobar in central NSW. The Australian shares were lower for a fourth consecutive day as traders continued to sell-off mining stocks. The benchmark S&P/ASX200 index was 0.3 per cent, or 12 points lower, to 3892.1, while the broader All Ordinaries index fell 0.4 per cent, or 16.8 points, at 3887.4.